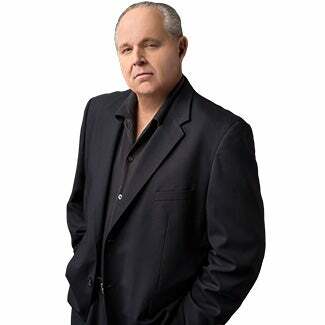 RUSH: There is a story today in The Politico. “Teflon Don Confounds Democrats — Democrats have attacked the president every which way, but polling and focus groups show none of it’s working.” None of it! In addition, Rasmussen has just come out with a poll. I printed it out here (shuffling paper) and guess what? A majority, most voters… Not Trump supporters; they are in this, but this is a sample of most voters. “Most Voters Welcome Trump’s Outreach to Congressional Democrats.” Now, the conventional wisdom is that Trump’s hurting himself, that Trump’s base, who are they? If you believe the media, Trump’s base is a bunch of Neanderthals, white supremacist right-wingers. They hate and they despise and they’re dumb and they’re stupid and they’re knuckle-draggers, and they will defend Trump no matter what he does and they are a vast majority of the American population — except they can’t explain how that group of people elected Trump. But that’s what they tell themselves. They lie to themselves about their opponents. They lie to themselves about themselves and their own supporters. “Despite their failure to advance President Trump’s agenda, congressional Republicans aren’t happy about his outreach to Democrats…” Paul Ryan… In fact, it has been learned that Ryan has told people at private fundraisers and private gatherings — and this isn’t a surprise, folks. At least it didn’t surprise me when I ran into it, that Paul Ryan has said that there is no chance for a border wall. It’s never gonna happen. That the Republicans are never gonna help Trump do this — and, of course, these private dinners are where fundraisers are taking place, where donors are, and Ryan was assuring them. It’s not a surprise to us. We know that the Republican Party doesn’t want to help Trump advance his agenda. But the Democrats, you know, Chuck and Nancy after their successful powwow with Trump on the debt ceiling, and Trump loved it ’cause something got done. Trump’s a doer. He’s not an ideologue. He liked getting something done. The Republicans are not helping him get anything done. So now he went to working with the Democrats and Rasmussen’s gone out and polled it. 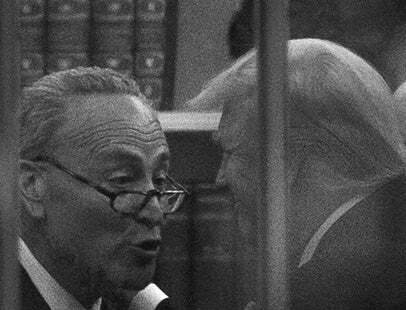 They have found out “66% of likely U.S. voters say it is good for the country if Trump works with congressional Democrats to advance his agenda. Just 13% think that the bipartisan cooperation” i.e., Trump working with Democrats “is bad. Twenty-one percent are undecided.” Now, likely voters is not a precise sample. You really want registered voters. Likely voters doesn’t include people that definitely do vote, and so what they think doesn’t matter as much, if they’re only likely to vote. But you have a pool of registered voters, likely voters, there’s more guarantee that that is a better sample. And only 19% here believe the president should continue to rely on congressional Republicans to pass his agenda. This has always been a danger. In my mind, it’s always been the danger. Trump, because he’s not an ideologue — meaning he does a lot of things that people like me and conservatives applaud, but he’s not one of us. He’s a doer. He will work with people to help get things done. He knows what got him elected. He knows the wall. He knows repealing and replacing Obamacare, taxes. He knows that stuff. But if he’s working with people aren’t gonna help him get it done, what good are they to him? And that’s who the Republicans are. So here come Chuck and Nancy. Chuck and Nancy are willing to help Trump get things done, and Chuck and Nancy are wily. Chuck and Nancy also know that Trump’s not an ideologue, and they can see that the Republicans don’t want to help Trump because the Republicans are scared to death of being tied to any success that Trump would have. We’ll give it some weight. I mean, it’s as good as any polling unit out there. None of them really have a firm foundation of authoritative accuracy going for them right now, so we’ll deal with this. Sixty-six percent of the American people are fine with Trump reaching out to Democrats. One of the factors here is that Trump really does appear to be Teflon. I mean, no matter what, it just doesn’t stick to him. It’s what the Democrats said about Reagan, and they hated Reagan for that. No matter what he did, nothing stuck to him. It looks like Trump is practically the same. And why would that be? Well, you can’t figure out the people that voted for Trump. And you’ve got… I don’t mean you personally. Talking generically. The people who continually in their minds or in the way they speak make fun of the people that voted for Trump, if you think that Trump’s voters are a bunch of hayseed know-nothings who are steeped deep in racism and bigotry and all of the usual cliches that the Democrats throw out, you’re underestimating dramatically who they are. They are people who pay attention and they are fed up with the way Washington has not been functioning or has been, either way, and Trump represents a brand-new fresh start by somebody that’s not been tainted by membership in the swamp. And as such there is tremendous hope. There are people in this country who the rule believe that we are on the verge of losing the country as founded. That’s laughed at, mocked, joked about, but these people that elected Trump believe it, and so they are personally invested in Trump, and they believe that Trump is going to do things that will make things better, and whoever he has to work with to get them done, according to Rasmussen, that’s what they’ll support. The Republicans are harming themselves in ways here that I don’t even think they are aware of. And the Democrats are too, with these hurricane telethons and this never ending assault on Trump. This Politico story — which I’m gonna get back to in a jiffy — is amazing. It details everything they’ve thrown at Trump and how none of it — none of it — is working. Every Democrat thing that’s always worked to destroy Republican opponents in the past, none of it is working! Which you need to ask: Well, why? And, of course, there is an answer, and I will, El Rushbo, have the answer. RUSH: We start on the phones in Jacksonville, Florida. Hey, Peter. It’s great to have you, sir. How are you? CALLER: Thank you, Rush. Infinite dittos. CALLER: I’d like to address Hollywood and the music industry. You insult me, you offend me, you mock me, you lie to me, and then you want me to go out and buy your movies, go to your movies, rent your movies, buy your albums? No. No. Not anymore. I stopped going to movies about a year ago. I do not go. I will not darken the door of a theater again. I’m fed up with these people. These are… They’re idiots and I’m done with ’em. I’m finished with ’em. They can all go you know where. RUSH: You know, you may not be the only one. I mean, summertime Hollywood box office has been in the tank. It’s been across the board. I don’t think… Has there been one movie that did okay — blockbuster okay — while the others didn’t? (interruption) Wonder Woman was about it, right, the only one that had any kind of box office? (interruption) The Stephen King movie’s doing okay? He’s a cult figure, though. But basically Hollywood in the summertime, it’s dangerously bad, and they’re concerned about it. So you’re probably not alone. CALLER: Well, there are a lot of movies that I would have loved to go see, but I’m not gonna give them my hard-earned money and then let insult me and belittle me. I’m done with them. RUSH: They’ve always done this, Peter. What’s new about it, Hollywood featuring a bunch of leftists that are anti-America, anti-conservative, anti-Republican? What is it now that’s got you bugged? CALLER: It’s been bugging me for years, but it just dawned on me not too long ago that why am I going to see these movies? These people are making $48 million to make a movie, then they get residuals also from a movie, and they insult me and want me to go give them more money? I’m not doing it anymore. No, I’m done. RUSH: Well, I appreciate the call. I know how he feels. This is not anything recent, but when I was younger and more naive, I can remember liking a particularly actor or actress — shows or movies they were in — and then learning who they really are and what they really think and maybe how dumb they are. It just blew up everything. I had no desire anymore. It’s like investing in an athlete who you think is a great guy and a hero and you find out he’s a reprobate. It just takes the wind out of your sails. I know what he’s talking about. But there is a blacklist in Hollywood, and these people… This is no excuse, but they have to say these things or they have to think this way to work, and anybody that tries to tell you differently is trying to smooth it over, because it really is true. I’ve heard it from enough people. I know it. It really is true. There’s a blacklist, and there is an accepted way or a required way to think. Hey, look, it’s no different than what’s happening to people like me outside of groupthink and consensus on climate change. You have to think this way. If you don’t, and you’re not gonna get hired. So one of the ways these actors — and I don’t doubt that it’s not genuine, but I also don’t know how deeply knowledgeable they are about these things. I think it’s pure emotional. But saying things in public, going on TV, it’s how they affirm their qualification and status politically with the people who hire and decide to pay people a lot of money. You know, everything has been politicized now, and Hollywood actually has been for a long time. Now, I’ve been trying to get back to this Politico story since the first hour, and it’s a perfect time to do it now since we have added all of the Hillary news and revelations today. Three things. First, I just saw that Trump is hosting Chuck and Nancy tonight for dinner in the White House. Chuck and Nancy are coming up to talk tax reform. Not Mitch and Paul, but Chuck and Nancy. Remember the Rasmussen report survey. I don’t think there is a modern American president… Nixon, maybe, during the confined period of Watergate. Outside of that, I don’t think there is a president, certainly in our lifetimes. I mean, it was brutal back in the days of the Civil War, the journalism. But I don’t think there’s a president in our lifetimes who has been the subject of a never-ending, 24/7 assault since the day he won his party’s nomination, then the election. I don’t think anybody has had to go through what Trump has gone through. 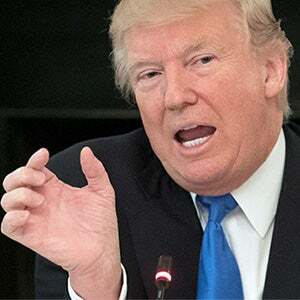 Just the daily lies, the distortions, the rumors, the leaks, the untruths, the allegations that his election was illegitimate because of collaboration/collusion with the Russians and Vladimir Putin. I mean, it’s never ending, and they go with something until it dies and they pick something else up and they go back to the Russians and get distracted. There’s a special prosecutor. They’ve invested everything! They’ve shot everything they have, and he’s still sitting there with an approval of 45 to 48%. They were able to knock George Bush’s number down into the thirties with four consecutive years of pounding Bush on the Iraq war. So what’s the difference? Why are they not able…? Why is it bouncing off Trump? Why is it not working? Well, there’s an answer, I think, but first some of the details in the story. It’s written by Edward-Isaac Dovere. “Democrats tried attacking Donald Trump as unfit for the presidency. They’ve made the case that he’s ineffective, pointing to his failure to sign a single major piece of legislation into law after eight months in the job. “They’ve argued that Trump is using the presidency to enrich himself and that his campaign was in cahoots with Russia. None of it is working. Data from a range of focus groups and internal polls in swing states paint a difficult picture for the Democratic Party heading into the 2018 midterms and 2020 presidential election.” But it’s important. The Democrats, until they read this… Actually, in their private moments — cloakrooms, when they talk to each — they know it isn’t working, and I guarantee you they’re befuddled and they’re confused and they don’t understand. That’s why they’re piling on. They think, “Maybe we’re not hitting him hard enough,” and they ratchet it up. But in their less-than-lucid moments, they really… I think some of them really believe they’re skating now to 2018. I think they believe that they have ruined Trump, and they’ve destroyed Trump and his ability to campaign, raise money for other people, other Republicans. They have the ability to lie to themselves and pat themselves on the back. But the truth of the matter is that none of this — and this is their playbook. They have not gone after Trump on policy. They’ve not tried to say that their policies are better, ’cause they don’t have any that they want to publicize. It’s been purely personal. They’ve done nothing but try to destroy Trump the man, the human being, the presidency and his career, and his life’s work and his family. I mean, they have gone after everybody. His wife. Even his 13-year-old son. “Data from a range of focus groups and internal polls in swing states paint a difficult picture for the Democratic Party heading into the 2018 midterms and 2020 presidential election. It suggests that Democrats are naive if they believe Trump’s historically low approval numbers mean a landslide is coming. The party is defending 10 Senate seats in states that Trump won and needs to flip 24 House seats to take control of that chamber. “The research, conducted by private firms and for Democratic campaign arms, is rarely made public but was described to Politico in interviews with a dozen top operatives who’ve been analyzing the results coming in.” So they won’t show the data to Politico, but they’ll tell ’em what’s in it, and they’ve done so. Anson Kaye, a strategist at media firm GMMB who worked on the Obama and Clinton campaigns, said, “If that’s the attitude that’s driving the Democratic Party, we’re going to drive right into the ocean.” Meaning, if they think they’re headed for a landslide win, they are totally mistaken. “Worse news, they worry: Many of the ideas party leaders have latched onto in an attempt to appeal to their lost voters — free college tuition, raising the minimum wage to $15, even Medicare for all — test poorly among voters outside the base. The people in these polls and focus groups tend to see those proposals as empty promises, at best.” Meaning, they don’t believe college is ever gonna really be free, and they don’t believe that Medicare is actually gonna be for everybody. Now, remember, these are Democrat polls, Democrat analysts telling Politico what they’re finding, and they are finding that none of their attacks have worked, and, in addition to that, they’re finding the issues that they’re trying to counter Trump with — free college, free tuition, Medicare for all, it’s not working, and they’re tired of what the Democrats are doing! They’re tired of the daily chaos. They’re not energized by it. Now, you might say, “But Rush, how do you explain Antifa, Black Lives Matter?” That’s not who we’re talking about here. Those people are irritating everybody. That’s the dirty little secret here. The military wing of the Democrat Party, this army of ne’er-do-well rioters, they’re ticking off everybody. And the never-ending allegations on Trump. Because there isn’t any truth to them. Now, even though they don’t like the chaos surrounding Trump, I want to read this again. The pollsters have found “that there’s strong support for a Congress that provides a check on [Trump] rather than voting for his agenda most of the time.” So that’s a little conflicting. If these people like the fact that the Democrats are putting the brakes on Trump, then why do they dislike the chaos? ‘Cause the chaos is part of it. So that’s something you have to weed through into even deeper data that would require psychological analysis to figure that out. But even beyond that, these same people like Trump ’cause he’s an outsider shaking up the system. Believe me, there is a general, what, malaise — stronger than malaise — about Washington per se. ‘Cause it is. It’s a mess. Nothing seems organized. Nothing seems focused and nothing that Washington says they’re gonna fix gets better. Areas of the country are improving, things are doing well, but not because of what Washington is doing, which, by the way, the real key is things do get better when Washington isn’t involved. “In focus groups, most participants say they’re still impressed with Trump’s business background and tend to give him credit for the improving economy.” That shocks them. That shocks the Democrats. It shocks these pollsters. Now, the poll says, “The window is closing,” but voters are still inclined to give Trump a chance to succeed. They don’t want him thrown out of office. They don’t want any of that. But they do believe that his business background is valuable and that the economic upturn is his credit. “More than that, no single Democratic attack on the president is sticking.” Not Russia, not collusion, not Trump enriching himself, none of it. None of these attacks, not one of them is sticking, meaning not one of them is doing any damage. “Many of the proposals Democrats are pushing fall flat in focus groups and polling.” The call for free college tuition causes resentment at ivory tower elitism. People do not think that free is ever gonna happen. They think free is a lie. They think they’re gonna pay for it if it’s free. They just don’t believe it. And when you throw free guaranteed income in, that really doesn’t poll well. So why? Why is none of this stuff sticking, when it apparently did to George W. Bush and it does stick to other Republicans? Why is it not sticking to Trump, do you think? RUSH: Okay. I’m gonna get to the answer to the question in the next half hour while you ponder and consider why is this stuff not sticking to Trump? ‘Cause there are reasons why the Democrat assaults — I mean, it appears they’re working if all you do is watch the Drive-By Media, but research polling data clearly shows it’s not affecting Trump’s numbers with the public. Now, the Republicans are scared to death of it, and it’s affecting them, but it really isn’t working. So we’ll get into that in the next half hour. In the meantime, Ron in Elizabethtown, Pennsylvania. Great to have you. I’m glad you waited, sir. How are you doing? CALLER: Great. Yep, Rush, I voted for Donald not because he’s a Republican, my friend. Because I need something done. I’m sick of the whole — since I was 18, Rush, the Republicans have let me down. Nobody — I’m Ron the bagman. I sell plastic bags. Your money’s not Democrat. Your money’s not Republican. It’s green. Pay the bills. Fix something. Do something. I pay taxes for what? You tell me, Rush. RUSH: No, I get you. But let me ask, you voted for Trump. How do you think he’s doing? Are you worried? You happy? CALLER: I’m happy with him. RUSH: You’re happy with him. CALLER: I’m thrilled with him. A bunch of little spoiled brats in the sandbox fighting over Tonka toys, Rush. RUSH: Okay. Let me ask you a little test question. You said you’re not a Republican; I understand. Does it bother you that Trump is working with Chuck and Nancy on things like the debt limit and national spending? CALLER: Nope. I’m thrilled. In fact, I should be going to dinner with them to explain the real world. I’m so happy he’s doing it just to irk the Republicans. The look on their faces, on Mitch’s and Ryan’s face, because they didn’t get to — I betcha they’re pouting like spoiled little babies right now. They’re all pissed. RUSH: I think you might be close. CALLER: If I’m not, I’d be amazed. RUSH: Well, I know they’re irritated. But, you know, the Republicans being mad at Trump is almost the same as Hillary being mad at Crazy Bernie. Trump has ever reason in the world to be mad. He ran as a Republican. They won and expanded their control in the House because of him. And right after the election I remember Speaker Ryan and others effusively praising Trump. Reince Priebus came on this show, he said, “I know, I know, we’ve got no more excuses.” And they were all out bowing down, “Thank you, Trump, we’re here because of Donald Trump.” And it was just words. If you’re Trump and you’re not an ideologue and you just want to get things done and the guys supposedly on your side are not helping you, you can’t help but notice. This caller’s reaction, though, is fascinating in another way. RUSH: Okay, now, why have all of these attacks — and this is The Politico saying so; it isn’t me. And you’re free to disagree with The Politico. Some of you may disagree. “It is hurting Trump! It’s ticking me off! It makes me mad. It’s causing other people to hate Trump who otherwise wouldn’t.” I understand that. But it’s not showing up in the official polling data conducted by Trump’s enemies — and in this case, I don’t think they’re gonna lie to themselves. They want to know if their stuff’s working or not, and it isn’t. So why isn’t it? Why did it work on Trump? May I inject myself into this to help you out in answering this? You know, I don’t ever want to make the program about me but sometimes it’s unavoidable, ’cause I’m so famous. Like this stuff on the Drudge Report today, these supposed podcasters now “dethroning” me. Nobody’s dethroning me. They’re not even close. It’s just wishful thinking. But they’ve tried. See, this is the point. Thirty years, and you lifers know every attempt they have made to damage me, to harm me, to trash me, to destroy me, to destroy the program. You know every effort, and you also know it hasn’t worked. Why? Well, let’s talk about Trump. There’s one thing Trump does that no other politician has ever done that serves the purpose of thwarting every day these allegations, accusations, these attempts to literally destroy Trump — and that it Twitter. As much as I shrink away from social media ’cause I think it’s a sewer, and I think it’s where human debris congregate, the fact of the matter is, it’s not all that. Donald Trump has the ability every day — and uses it — to not only fight back and properly characterize the people attacking him. He also daily, multiple times a day, tweets what his agenda is and what he’s trying to do and what he has done. He is doing the job an otherwise responsible media would be doing. But they aren’t. He is recording his successes. He’s telling about the meetings he’s having and the people he’s talking to, the progress he’s making on things. He calls out the people that are standing in his way. He explains why he’s not doing this or is doing that. But that’s not it alone. None of that would work, none of that would matter if there weren’t something else. And that something else is what we were talking about earlier: He has a connection. All of this media attack on Trump is designed for one group: Trump supporters. They are trying. They know that if they can cause you Trump supporters to abandon him, then Trump is finished — and so that’s what all of these efforts have been aimed at is you who support Trump. Just like the efforts to whatever they’ve been trying to do is aimed at you. They would love to have you turn this show off. They’d love to be able to prove that you’re doing it. But in 30 years you haven’t and they can’t, and so the question is: Why? Well, in Trump’s case, he has this connection, he has trust, he has believability. He has a bond with people that he built. Now, many people are famous, and many people are celebrities. But many of them are so not because of anything they’ve done to, quote-unquote, earn it. They have just been proclaimed. They’re treated — they’re written about, covered — as celebrities, meaning the media makes them. Well, and when the media makes you, the media can destroy you, and this is why so many in the entertainment community salivate and genuflect and do everything they can to butter up the entertainment media, because if they turn on you, you don’t have a microphone to go to. They can tweet, but nobody cares ’cause they haven’t built up a personal connection with their audience. Very few Hollywood stars have this connection. Now, their connection is of a different kind. The way to illustrate it is if people who voted for Trump saw Trump… Let’s say you’re an airline or an airport and you’re at baggage claim. You’ve just arrived, and Trump is at baggage claim; he just arrived. You see Trump, you’re a Trump supporter, you would think nothing of walking up and talking to him. And he would gladly welcome you to come up and talk to him, and you would think of him as your friend. You know him, and anything you talk to him about, you know he’s gonna understand. The context is there, and he’s gonna be polite and he’s gonna thank you and you’re gonna have a conversation. Other people are famous celebrities, but you would never approach ’em. You look at ’em, you’ll nod, you’ll jab people, “Look, look over there, there’s –” I’ve seen this. There’s no connection. There’s the fame and there’s the celebrity and there’s the recognition factor, but there isn’t the connection. And if the media has nothing to do with building that connection, then the media can’t destroy it. I don’t know if these guys in this Politico story, these pollsters know this. I don’t know if they are aware of this particular element. I don’t think they are. I think they really believed, and maybe still do, that one of these attacks is gonna work. That one of these days they’re gonna be able to destroy Trump, in your mind. Now, our last caller, our last caller said something that I think is a very crucial thing the Republican Party had better start taking seriously. I wasn’t able to hear everything the guy said. I gathered he was a Republican, but he’s an angry Republican. He voted for Trump, and he doesn’t care that Trump is working with the Democrats. The more the better. Trump working with Chuck and Nancy on the debt ceiling, bring it on. Trump working with Chuck and Nancy on tax reform, bring it on! Why? You hear what he said? He is so angry at the Republicans, he wants them to just have it stuck to ’em! Whatever it takes. He is so angry at them that if it takes Trump working with the Democrats to move his agenda, he’ll applaud it! That, in a political world, that is serious, serious stuff. Salena Zito had a column we quoted earlier in the week. You know, she’s gone out into these previously blue states, and she’s talked to and she’s kept relationships with all these former Democrat blue state voters who voted for Trump. And she goes out periodically, revisits them and takes their temperature. And what she has found is that people are voting Republican not because they like the Republicans. It’s just that they dislike Democrats even more. But there isn’t a lot of affection for either party right now. And so the clear beneficiary of that is Donald Trump. And where his voters are concerned, whatever he has to do, whatever he has to do to succeed, if he has to have dinner with Chuck and Nancy to get the wall built, fine and dandy, go for it. If he has to have dinner with Chuck and Nancy to get this done, fine and dandy. They are so desirous of what they consider to be the Washington establishment getting the message. They don’t think electing Trump was enough to send the message. I think they’re sitting out there thinking the Republicans still don’t get it. They think Trump’s temporary. They think they’re gonna be able to get rid of Trump. When they get rid of Trump we’ll get back to normal. And I think they think the Republicans don’t realize how serious the situation is. That’s what I heard in the last caller. And these Democrats and all their polls and their inability to do any damage to Trump whatsoever, and then the Rasmussen story, with all these Republicans saying, “I don’t care if Trump goes out and works with Chuck and Nancy. If he has to work with Democrats –” Because they believe in Trump’s agenda. That’s why he was elected. He made no secrets about what it was. And they want it to happen. Now, you might be saying, “But, Rush, doesn’t Trump realize that Chuck and Nancy don’t want a wall?” That’s not what they’re thinking. They think Trump is gonna get the wall. They have no doubt Trump’s gonna get the wall and that if he has to work with Chuck and Nancy to get it, whatever, he’s gonna get it. But if the Republicans are seen as the obstacle to Trump’s agenda, they’re gonna bear the brunt of the wrath. And that is what is happening.